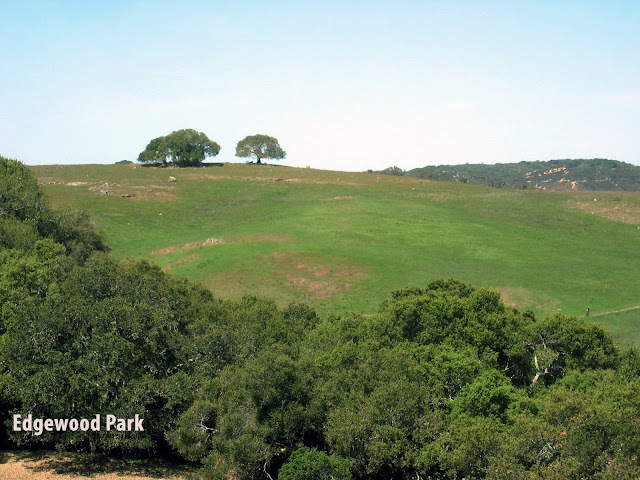 Answer: Wednesday search challenge (5/29/13): Who owned Edgewood Park before it was a park? 1. Who owned the land that would become Edgewood Park between (around) 1908 until his death in 1930? 2. This man was quite a character: What was his job? And what athletic records did he hold? 3. What did he hold a patent for? 4. And, if you have the time, where is he buried? 2. He was a clerk for the California Supreme Court. 4. Union Cemetery, Redwood City, CA. Now... let's talk about how to find answers to questions like this. quickly led me to both the park's website (interesting, but not helpful for this search), and the "Friends of Edgewood" site (interesting AND helpful!). From that site, I found a couple of Acrobat files, including the Strategic Plan which has a nice section detailing Henry Finkler's acquisition of the property in 1908 from John Issac. The Taylor family acquired it after Finkler, and then the State of California acquired the land through eminent domain to build a new college campus in 1967. Those plans fell through in 1980 and the state sold it as excess property to the county. It is now a preserve, a place that's not quite pristine, but definitely a lovely place to visit. Finkler's father, a supreme court bailiff, committed suicide when Henry was 19, leaving Hencry C. to assume his father's position as court bailiff, eventually becoming Senior Secretary. He was obsessed with gathering weather stats, claiming that where he lived was one of only three perfect climates in the world. His weather records were used to support the prize-winning slogan, “Climate Best by Government Test,” which is still Redwood City’s official slogan. 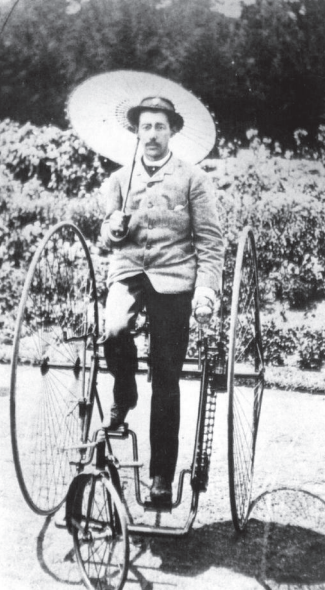 In his early years, he also "competed in high-wheel (pennyfarthing) bicycle riding and became the state champion in both short and long distances." Here's an image from the FriendsOfEdgeWood site that's just charming... and gives a decent idea of the man. 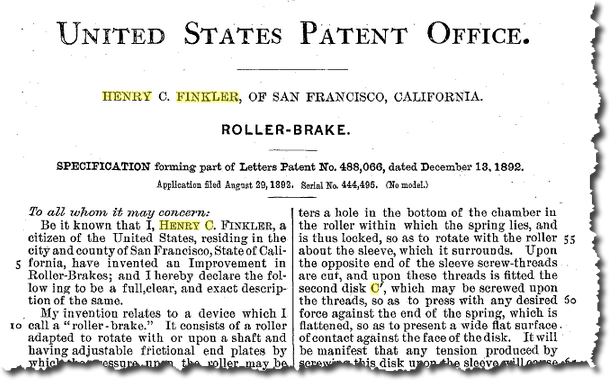 You'll find he's in Redwood City, only a few miles from where his house was built very near to Finkler's bridge. He is buried at the Union Cemetery, in a masonic plot (here's a pic of the grave, with the masonic symbol). The newspaper accounts are full of the lurid details of his life... tabloid stuff even now, 83 years later. Wednesday search challenge (5/29/13): Who owned Edgewood Park before it was a park? As a consequence, the place is full of wildflowers, and threaded through with trails that go from deep forest to open hillside. In the spring, streams run down the hillside and bird song sounds throughout the whole place. It's really wonderful. So, being a curious fellow, I wondered how such a large park in the heart of Silicon Valley came to be. I did a little research, and discovered a remarkable tale of a man who seems as though he stepped out of a storybook, which leads to today's challenge. As always, let us know HOW you found this information, and about how long it took you to do so. As you remember, StephanieW from Mariner High School wrote in with a question about how difficult it was for her students to find political cartoons about a particular even from the time when that event was taking place. 1. 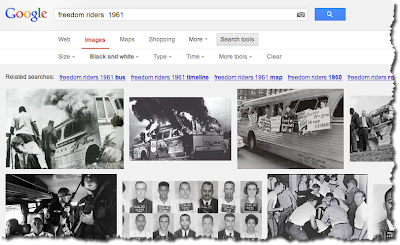 Can you find a political cartoon about the Freedom Riders that was published during the time of the Freedom Riders? 2. What advice can you give young searchers about how to solve this search challenge? leads to a whole pile of articles. I learned that the Freedom Rides happened during May of 1961 when a dedicated group of men and women, black and white, boarded buses bound for the deep South to challenge segregationist practices and non-compliance with the US Supreme Court decision that prohibited segregation in all interstate public transportation facilities. I turned on the black-and-white color filter, and ended up with an awful lot of images (and no cartoons). and this time, I didn't turn on the black-and-white filter. This gave me a pretty good result. 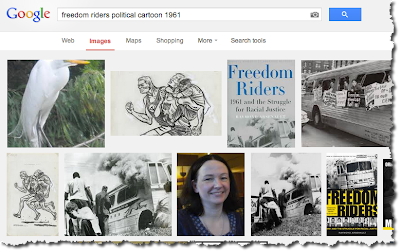 There are two cartoons here (well, the same cartoon twice) entitled "Anti-Freedom Riders." 2. 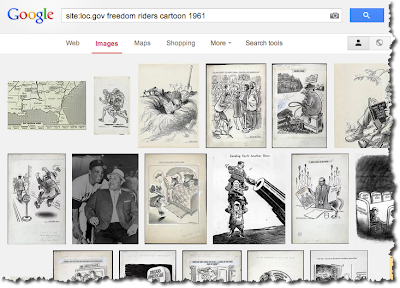 The cartoon is from MyLOC.gov (that is, the Library of Congress). This gives me two additional research strategies. 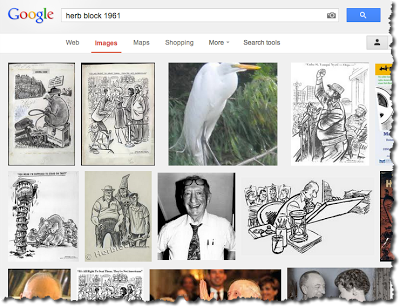 Let's check to see if Herb Block had any other cartoons on the topic. 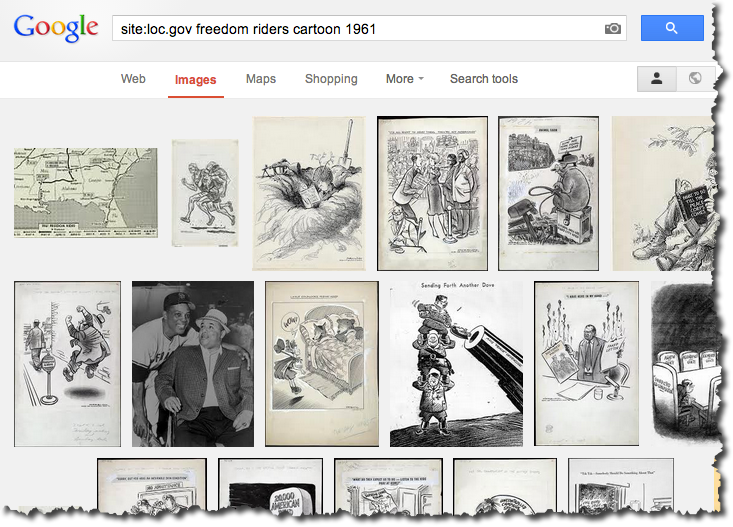 Which gives us another Freedom Rider cartoon (the three guys, 2cnd row, 2cnd column). 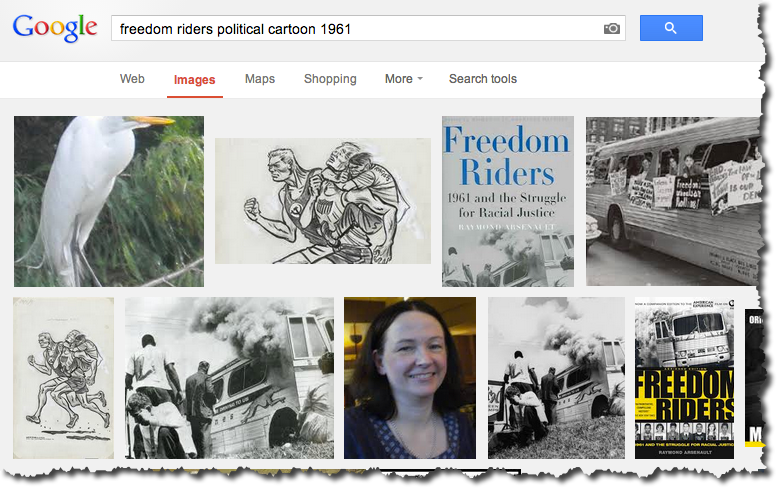 When you click through the image, you find the cartoon described as "We don't want no troublemakers from the United States" with the cartoonist using three armed thugs to criticize the mob that attacked the Freedom Riders in Montgomery, Alabama, on May 21, 1961. This is interesting because it's showing that another, very different strategy sometimes works quite well. So now I'm curious about the other item we noted from above, that is, that the LOC has a cartoon collection (who knew?) that might be worth checking. 4. Search sites that have collections of the thing you seek. In this case, let's check the site LOC.gov these kinds of cartoons. In this case, let's stick with Image search. As you can see, these cartoons are a little far apart. So this really WAS a pretty good challenge. What would we tell a student about searching? I've collected several of the ideas from the comment stream together and edited lightly. When you search for something specific that is part of a larger subject, back up and search more for general terms. Use terms related to the subject like racism, segregation, freedom. Google will often synonymize these for you to give you ever larger scope. Note that once you find the first item (the first cartoon), it's useful to read the text around the image to get more ideas about what to search for. Example: while we called them "political cartoons" here, they're also called "editorial cartoons." Knowing about both terms can be useful. Have an understanding of the place and time so you can focus in on dates and places in your searches. 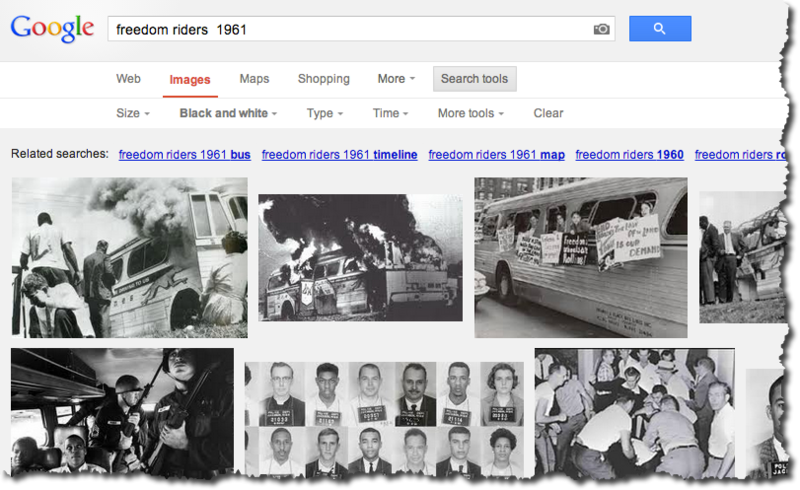 Here, we used 1961 as an important search term. Persistence is required. On a great topic like this, it's important to NOT be distracted by the other cartoons available. Also, while Google Images is great, sometimes the images you are looking for might not be in a corpus that Google Images uses or has access to. Think about where the images would have originally appeared. In this instance it would most likely be newspapers and magazines. Know what archives your school and public libraries offer. Sometimes what you think might be in a political cartoon, in this example "bus" might not be anywhere in the cartoon due to the use of different language, a different perspective, or metaphorical use of language. A key idea is that sometimes you get caught up in trying to give Google too much information. A good strategy (especially on difficult searches) is to use fewer search terms to help get the results you were looking for. And sometimes it's useful to follow up your searches with the strategy of including a specific person (e.g., Herb Block, above) to find other items by that person. This was great. Thanks again to StephanieW and her students at Mariner High School! From Wikimedia. Political cartoon from 1807. 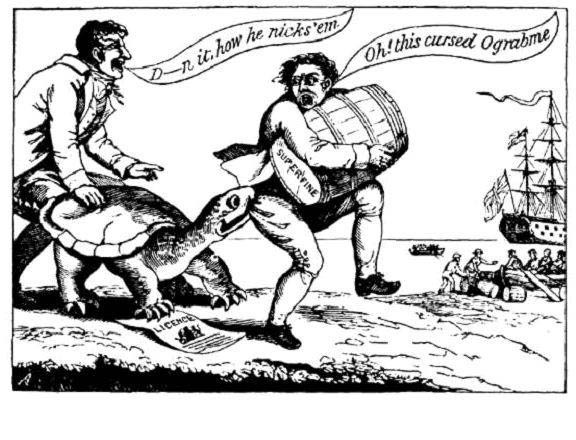 A political cartoon about the US embargo of England and France during the Jefferson administration. This is the first of our SRS user-contributed challenges. I'll be using these on and off over the next few months. The ones sent in were just great, and have me scratching my head trying to solve them! I am a high school librarian currently working on a Social Studies project with two teachers in my school. Students pick an event from U.S. History that happened anywhere from 1945-2010 and they analyze it from a political, social, economical, and historical points of view. One of their tasks is to find a political cartoon from the period and analyze it as well. Recently, two students told me they couldn't find any political cartoons for the concepts "Freedom Riders" or "Lunch Counter Sit Ins." I was surprised and just thought they couldn't "search" correctly. So I started going into Google Images and there is very little out there. I thought about my word choice (political cartoon, editorial cartoon, cartoon, civil rights cartoon). I also thought about a specific date range, I also tried black and white, line drawing. I tried searching through .gov (Library of Congress) and newspapers, all to no avail. It took a lot of searching to find something that would work. There were lots of nods of current political cartoons with references to the past, but finding something from the actual time period of these events was difficult! Is there something that I am just overlooking? I'd love to know, as political cartoons are a big piece of our history and capture the sentiments of a time in a very visual way. As usual, please let us know HOW you solved the problem, and please give us an estimate of about how long you took to find an answer. Answer: What's YOUR search challenge? So far I've gotten about a dozen suggestions--all excellent!--that you'll see in the weeks ahead. As I said, I'll be sure to give credit to the original author (although I might edit them a bit). Since I've been doing a lot of work on MOOCs recently, it occurred to me that writing tests, quizzes, and short questions is much like writing Search Challenges. They're not easy to create. Sure, as a longtime teacher I've written my share of tests and quizzes, but until I started writing them for the blog and for AGoogleADay.com, I never really spent a lot of time working through the solution. After all, I knew how to solve them, so why bother to do all that extra work? The reason, as professional teachers will tell you, is that little things will reach up and bite you. "Simple" questions sometimes have unanticipated extras, additional complications or sub-problems that need to be understood (and solved) along the way. Moral: Test your problem before assigning it to your students. I think it's okay to hand out difficult (or even unsolvable) problems, but you (as the teacher) really need to understand the complexities involved. And that, my friends, is what makes writing Search Challenges so interesting! Crazy-hard problems that I wrote 2 years ago are now trivial. Problems that seem easy, sometimes are immensely difficult to find. What's more... this changes all the time as the web changes (for both good and ill) and as search engines change, increasing capacity, crawling of content and indexing ability. Thanks for your contributions. My email door is always open for new ideas and suggestions. If you come across a difficult-to-search-for problem in your daily life, let me know! I might be able to help you out, or at very worst, we can make it into an interesting search challenge for everyone to learn from ! Wednesday search challenge (5/15/13): What's YOUR challenge idea? Well, it finally happened. I hit an unfortunate triple-witching point this week and I don't have a clever Search Challenge for you. Then it occurred to me: The ultimate search challenge would be... to ask YOU to send in a search challenge! I'll summarize whatever comes in tomorrow. Remember: The point of a search challenge is to be (a) interesting, (b) solvable by using search methods, and (c) have a teaching point to improve your search skills. If you think you've got something you'd like to share with SearchResearch, send it in! I'll be looking! Answer: What was the defining publication? I should have known that many SearchResearch readers would know about derechos. I’m impressed that there are so many searchers living in Maryland and places affected by the storm. Short answers: This particular big storm was a derecho, first published in 1878, Iowa Weather Bulletin Volume 1 Number 1, Dr. Gustavus Hinrichs, Iowa City, Iowa 1878. I quickly learned this kind of wind storm is called a 'derecho' which is a fast-moving linear storm system with extremely high winds. Unlike a tornado or hurricane, it doesn’t rotate, but flows rapidly eastward causing damage as it goes. and find dozens of news reports from the time. CAPTION: Warnings from the NWS on June 29–30. Red are tornado warnings, yellow are severe thunderstorm warnings, green are flash flood warnings, and purple are special marine warnings. In the Wikipedia article I found that derechos are seen as long linear clouds, “shelf clouds,” that show the advancing front. Derecho comes from the Spanish word in adjective or adverb forms for "straight" (adv, adj. 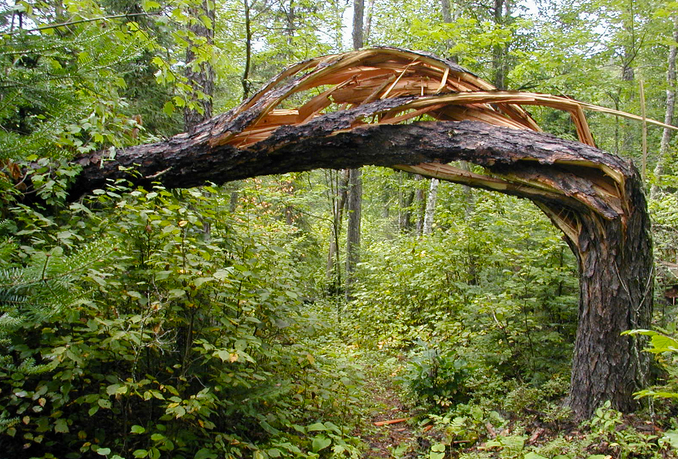 "direct"), in contrast with a tornado which is a "twisted" wind. Wikipedia tells us that the term was first used in the American Meteorological Journal in 1888 by Gustavus Detlef Hinrichs when describing the phenomenon of a derecho that crossed Iowa in July, 1877.
and limiting their search to 1888. It’s simple to find the book, search inside the book for the term “derecho” and find it on page 307. This is a great approach, and often works for archival research papers like this. Curious about this, I looked up the Wikipedia article about Gustavus Hinrichs and discovered that he was actually a chemist, best known for his discoveries about periodic laws in the relationships between elements. This work was important in leading up to the Periodic Table of Elements (although he didn’t do the work of Mendelev—Hinrichs’ periodic table was in the shape of a spiral). But he had a longstanding interest in weather, and was also the founder of the first state weather and crop service while a professor at University of Iowa. Hinrichs’ first weather station was at his home in Iowa City at the corner of Capitol and Market streets. Flags on top of his house were barometer readings, and thought of as weather predictions by the locals. The Wikipedia article led me to an article at NOAA (the government weather service). And the NOAA article also has a link to a PDF of his report from 1878… What's odd about that report is that it looks like it's a handwritten document. So then how was it distributed? This was well before photocopiers, and while it's possible he wrote it out as an engraving, it would have been really hard to do so. 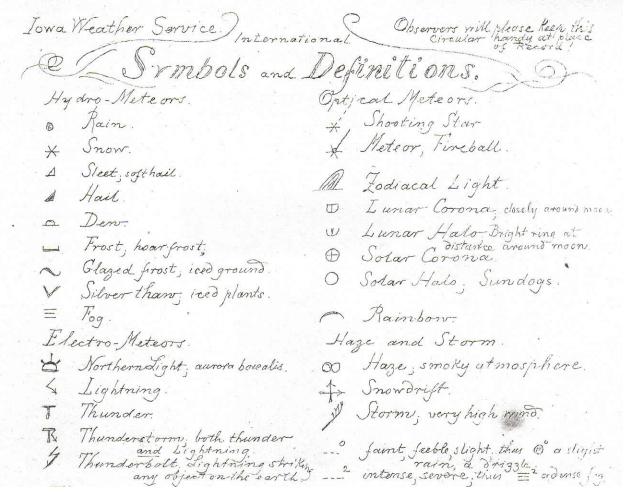 Later in NOAA site it mentions that the original publication done by electric pen, an Edison invention. Fun side note: Did anyone else notice the “Symbols and definitions” section at the beginning of the paper? I was surprised to see “Hydro-meteors” (rain, snow, sleet…) and “Electro-Meteors” (northern lights, lightning, thunder…) and “Optical Meteors” (shooting star, meteor, fireball, Zodiacal light…) as three separate categories. Does anyone know why these were broken out in this way? Search Lessons: This challenge was successfully solved by lots of searchers—well done! The key here was to pull together information from a number of different sources (looking up the wind storm date to learn it’s a “derecho,” then looking up derecho to find the publication, then reading that to find it to find out there was an earlier publication). This is a great skill to develop, especially in younger searchers, who tend to stop short of double-checking their findings. Wednesday search challenge (5/8/13): What was the defining publication? While visiting friends in Maryland, I asked about why a particular tree in their yard was cut down to a stump. I hadn't remembered seeing it like that when I visited last year. What happened? 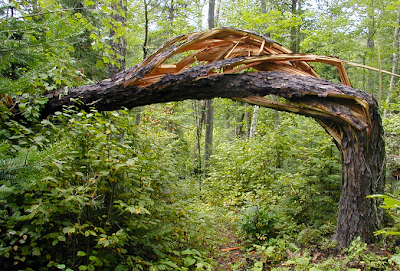 They explained that a massive wind storm had swept through this part of Maryland last year just after I'd visited and had destroyed the tree. "That's odd," I thought, "I don't remember any tornados in Maryland in 2012... what happened?" I was able to find out after just a few moments of research. It was a specific kind of storm that wreaked widespread devastation throughout Maryland. And this leads to today's challenges; there's an easy form, and a more challenging question. As always, please let us know HOW you found the answer(s), and about how long it took you to find it. Answer: What was the name of that stream? When you're trying to track someone down these days, a reasonable first starting place would be their G+, Facebook, or Flickr social postings. Or, in my case, since you know I have a Home Page, you might check there. 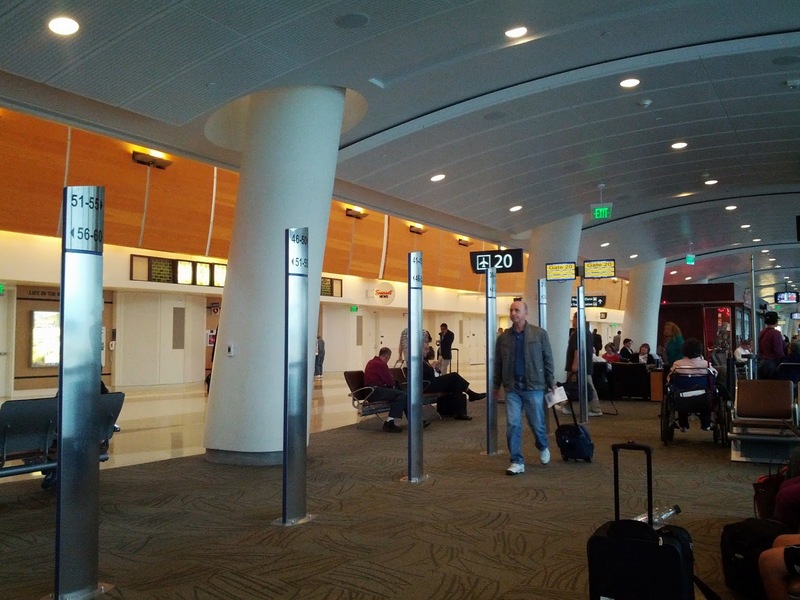 If you do the obvious query, you'll find both my G+ update and my conference travel update. tells you I'm probably in Paris, and checking my G+ post confirms it. I posted a CHI2013 event yesterday afternoon. 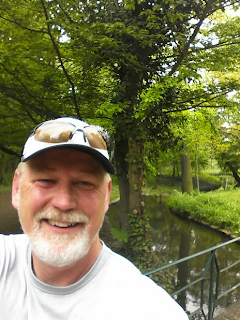 Now that you know I'm in Paris, let's look at the parks and see if any could possibly look like the one in that photo. Here's the photo. The key features we'll want to look for in the map are a large green park with a long boulevard running through it, with a large freeway-like thing and a traffic circle near one corner. At this point we suspect that it's the Bois de Boulogne, so let's search for that and read up a bit. Leads to the Wikipedia article, which suggests that there is a stream running through it, which sounds even better. and find the conference page that reveals that the conference is being held at the Palais des congrès de Paris. 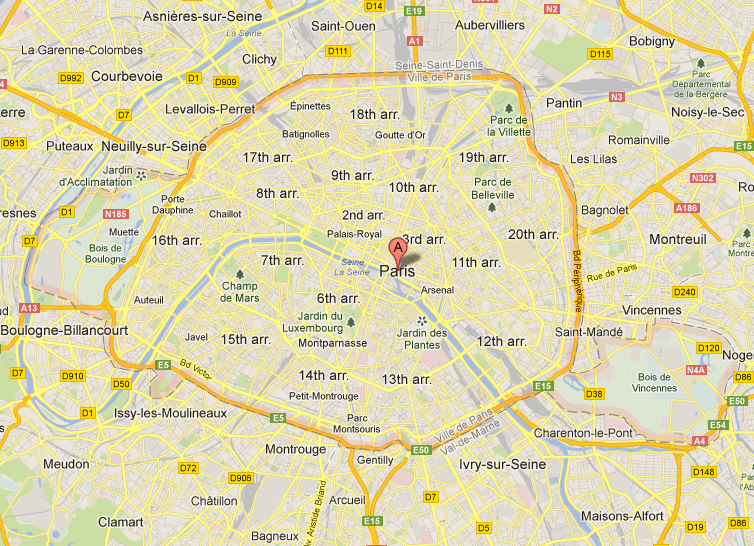 Map that out in Google Maps, and you'll see it's right on the edge of the Bois de Boulogne. There's also a conference hotel by the Palais that's positioned exactly right to create my photo. Once you look for the word "stream" in the article on the Bois, you'll see that the stream called the Ruisseau de Longchamp (1855) is the major (artificial) stream in the park. It flows through the Pré-Catelan area of the park, under the alley of Reine Marguerite, then to the Mare des Biches, one of the oldest natural ponds in the park, then to another reservoir and the Grand Cascade. [The architect's ] plan called for long straight alleys in patterns crisscrossing the park and, as the Emperor had asked, lakes and a long stream similar to the Serpentine in Hyde Park. Unfortunately, Varé bungled the assignment. He failed to take into account the difference in elevation between the beginning of the stream and the end; if his plan had been followed, the upper part of the stream would have been empty, and the lower portion flooded. When Haussmann saw the partially finished stream, he saw the problem immediately and had the elevations measured. He dismissed the unfortunate Varé and Hittorff, and designed the solution himself; an upper lake and a lower lake, divided by an elevated road, which serves as a dam; and a cascade which allows the water to flow between the lakes. This is the design still seen today. And while there are many trees in the Bois, the one that caught my eye was the Redwood tree, the California state tree. Wednesday Search Challenge (5/1/13): What's the name of the stream? Today I went for a run in this park. 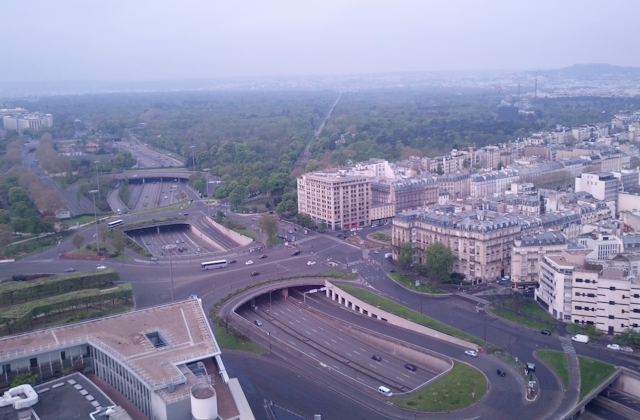 (I took this photo from my hotel room, not very far from the park.) As you can see, it's a fairly large park in a well-known city. As I ran, I ended up running along a stream. Alas, there were no signs to tell me the name of the stream. There's only one stream in the park (so far as I can tell). BUT, just to save you some time--I've removed the EXIF data from the photo, so you'll have to do something other than just looking up the lat/long. As you know from last week, I love to know what kind of trees I'm seeing as I run. In this case, as I was running along, I saw a particular tree of a particular type that reminded me of home. Can you tell me what kind of tree I saw? Tell us not just the answer, but HOW you figured it out!